Enhancing the effectiveness of our Chill CBD oil with the highest quality organic passion flower extract can help accentuate the relaxation or “chill” factor. The synergistic benefits of combining our organic CBD oil with a variety of herbs and plants is continually being explored at 101 CBD. We use only the plants and herbs that are backed by scientific research and long histories of use. Many people may still be unaware of the potential for increased benefits of adding herbs like passion flower to our organic, raw, full spectrum CBD. Experienced herbalists and scientific research guide the utilization of the most effective parts of each plant. With passion flower, this includes all the parts of the plant that are above ground, including the flowers, leaves, and fruit. 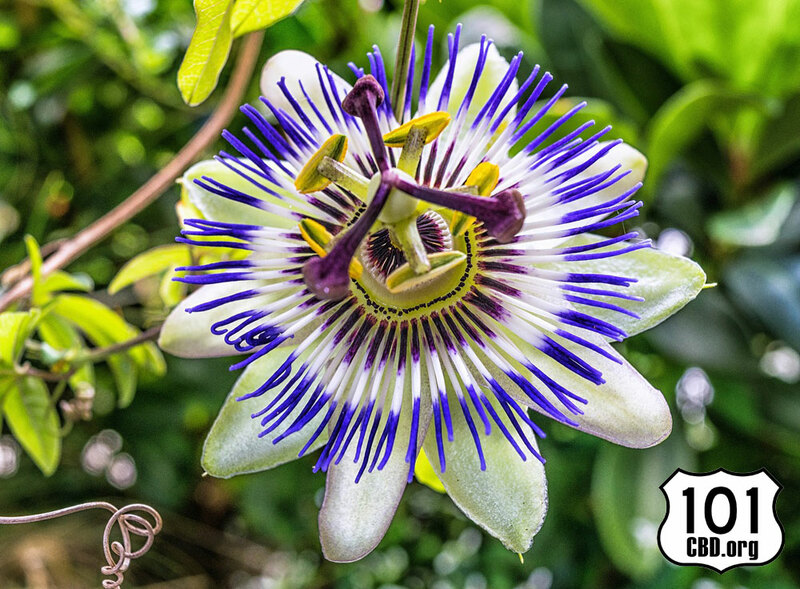 Passion flower has been researched around the world for over 100 years. Its sedative, antispasmodic, analgesic (pain reliever), anti-anxiety, central nervous system depressant, and hypotensive (lowers blood pressure) effects have been firmly established in science. Passion flower’s main uses are for mood disorders (depression, anxiety, stress), insomnia and sleep disorders, headaches, migraines, and general pain, stomach problems (colic, nervous stomach, indigestion), and the relief of menstrual cramps and premenstrual syndrome (PMS). There is also evidence that passion flower can reduce the effects of menopause some women experience such as hot flashes, night sweats, and insomnia. These effects can also include anxiety and depression, which may be related to low levels of a brain chemical, gamma-aminobutyric acid (GABA). Passion flower can be used to treat these symptoms by increasing the GABA levels. It can also prevent production of monoamine oxidase, similar to an antidepressant. Some studies have also shown that passion flower may be as effective as synthetic drugs for generalized anxiety disorders. Compounds in the extract interact with brain receptors to provoke relaxation, and because passion flower increases GABA, anxiety can be reduced and relaxation increased. Unlike CBD, individual herbs do not have Endocannabinoid Receptors throughout the body to provide assistance to a wide and still expanding variety of needs. However, they do offer specialized assistance that varies with each unique herb. So, by using the highest quality organic passion flower extracts synergistically with our Chill CBD oil, we strive to provide a more effective and helpful product. We always enjoy hearing from you and remain especially interested in your experiences with our enhanced CBD products at 101 CBD. Hi Dany, Sorry for the delay in responding. Our hemp is sourced in the US. The Farm Bill is scheduled to pass this month so we are waiting to ship international orders until then. Would you like us to contact you when that happens? I suppose you live in Canada?